The last surviving ship from the Battle of Jutland provided a fitting backdrop for a commemoration honouring its centenary and all the Irish sailors who served in the First World War. The event at the Belfast dockside adjacent to the freshly refurbished HMS Caroline was attended by Prince Michael of Kent and a host of other dignitaries. The memorial heard poignant testimony from a number of descendants of those who saw action on the high seas during the conflict. On a glorious sunny afternoon, wreaths commemorating those who died were dropped by Navy officers into the relatively still waters of Belfast Lough. 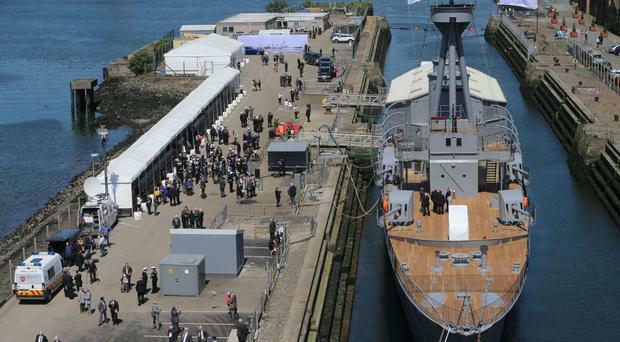 The commemoration was held a day before the restored HMS Caroline will open to the public as the latest maritime-themed visitor attraction in a redeveloped dockland area that already boasts the award-winning Titanic Belfast centre. At the close of the event, Prince Michael cut a ribbon to mark the completion of the £15 million-plus lottery-backed restoration project. "It is indeed fitting that we remember and commemorate today the sacrifice made by the Irish sailor at Jutland and throughout World War One in the presence of Caroline in her 'Jutland Grey' paint scheme," he said. The royal visitor added: "Ultimately the story of HMS Caroline is the story of her people. It is the telling of the stories of all those who served in Caroline for over 100 years that makes the life of this ship so compelling. From tomorrow, everyone can share in this." 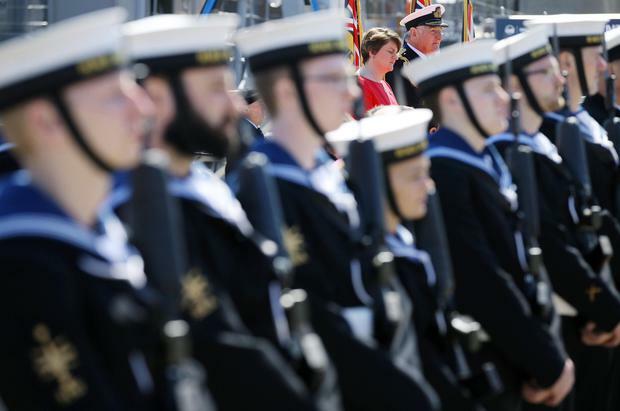 The ceremony that paid tribute to sailors from across what was then the pre-partition island was attended by Northern Ireland Secretary Theresa Villiers, Stormont First Minister Arlene Foster and the Irish government minister Paul Kehoe. Of the 8,000 plus who died in the 36-hour Battle of Jutland, 358 were from Ireland. Around 10,000 Irish sailors saw action in the First World War. Among descendants who addressed the audience at Alexandra Dock was Marie McCarthy, whose Co Cork-born grandfather Daniel Fitzgerald was a stoker on board the Caroline. "My grandfather experienced and witnessed the horror and suffering of the Battle of Jutland while shovelling tons of coal in the bowels of this ship," she said. "I suppose one could conclude that he possibly survived because he was buried deep in the ocean in a coal dust laden atmosphere within the confines of the stoker's area, tolerating temperatures of 150F (65C). There was poor ventilation and it was exhausting, backbreaking work." Gillian Davies' grandfather James Weddick was a gunner on the Caroline. He was born in Co Limerick but moved to Liverpool as a child. Ms Davies told the commemoration: "It is an honour for the Weddick family members here today to remember, not just our grandfather and great-grandfather but all Irish sailors who lived and died in the 1914-18 war at sea." Weighing 3,750 tons and measuring 446ft (136m), HMS Caroline, which was built on Merseyside in 1914, was part of the screening force which sailed out ahead of the Royal Navy's Grand Fleet during the battle off Denmark to establish the position of the German battleships. Both sides suffered heavy casualties in what was the most significant clash between battleships during the First World War. Britain and Germany both claimed victory. Six years after the war ended, HMS Caroline was moved from Portsmouth to Belfast to become a training vessel for local Royal Navy Reserves. Most of the rest of the fleet was decommissioned and broken up. HMS Caroline performed its function as a drill ship up until 2011, apart from during the Second World War when it was used as an operations headquarters for the efforts to protect the Atlantic convoys from German U-boats. The vessel, which is docked in the same shipyards where the Titanic was built, was in danger of rusting away or even being scrapped before moves to save it started to build up steam three years ago. The ship came dangerously close to sinking during the big freeze that hit Northern Ireland in 2010 when pipes and radiators burst. The £12.5 million grant awarded to the restoration project by the Heritage Lottery Fund represents the biggest-ever single contribution in Northern Ireland. Sir Peter Luff from the Heritage Lottery Fund said: "Caroline is a hugely important ship for the Royal Navy. It's one of only three survivors from the First World War and the only survivor of the Battle of Jutland. "It's also hugely important to Belfast because she has been here for 92 years. "I think her restoration not only is a mark of her enormous contribution to the events of the tumultuous last century but also it significantly increases Belfast's maritime tourist attraction." Secretary of State Karen Bradley has said she will hold talks with Northern Ireland's political leaders later this week in wake of the murder of Lyra McKee. A 57-year-old woman arrested in connection with the murder of Lyra McKee has been released unconditionally. Fire chiefs have called for vigilance as hundreds of firefighters battle blazes across Britain’s parched countryside.